Ty Segall’s drum kit, Chad Ubovich’s Bass and Charles Moothart’s guitar simultaneously explode into life, igniting a feisty crowd who are chomping at the bit. Like rabid dogs who had finally broken free from their leads, a wave of enthusiastic teens surge forward and drag each other about during the first few chords, causing me to retreat in fear for my camera’s safety. By song 3, a third of the crowd have already worked themselves into an exhausted, sweaty mess. I’ve no idea which track they started with. Rewind to the sound check – Ty has set up his drums as close to the front of the stage as he can. 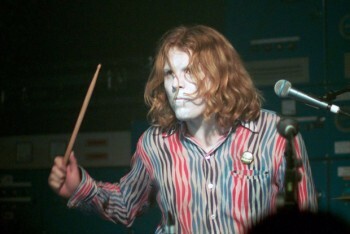 His facial expression, beneath his white face makeup, is one of intense concentration as he tries to deal, psychologically, with the demands of the sound engineer. Ubovich wails manically into his mic when requested, sounding not dissimilar to Police Academy’s Zed. To enhance the effect of his white facepaint, he has chosen to wear a multicoloured tie dye gown. Charles, the somewhat more introverted of the 3, appears chameleon-like in a dark green shirt that almost perfectly matches the colour of the back wall. If you’re quick and cunning enough, you may catch a glimpse of his black lipstick, under his long hair. The sound check brings applause and reactions from the crowd, so you can imagine what the atmosphere is like as Fuzz run through the tracks from their self-tilted debut album. ‘Sleigh Ride’ and ‘Raise’ maintain the early pace, but it’s the slower mid-section that impresses most. ‘What’s In My Head?’ allows everyone to gather their breath and proves to be a highlight. They follow with a progressive, bluesy tune that showcases their individual talents, reminding me somewhat of Dead Meadow – a direction that they lean towards in teaser track ‘Rat Race’ from their forthcoming album ‘II’. ‘Pollinate’, however, from the same In The Red release due in October, is pure, heavy rock. ‘HazeMaze’ slows almost to a standstill, but finishes strongly after an impressive solo from Charles. News that they will only play one more tune… or “maybe two”, does not go down well. Despite music being played through the speakers after they walk off stage, an encore is half expected, as the lights are still out. Many will regret leaving at this point – the band eventually hear our cries and return, cheekily taking it in turns to timidly play just a few notes on their instruments. Thankfully, there’s more mayhem and musical wizardry, before they kick us out. The secrets behind Ty’s prolific output are plain to see when he is on stage. His face expresses sheer joy, as he rolls around the drum kit, while singing his lyrics, flanked by his equally skilled buddies, in front of a delirious and adoring crowd. It’s times like this that must drive him on as he embraces and nurtures the energy of the live performance and the reactions from all around; soaking it up and throwing it into his next project. It’s enough to inspire anyone into action. Whenever Ty and friends return to my neighbourhood, whatever instrument he’s playing, in whatever band, I’d very much like to be there.